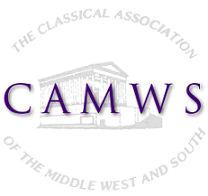 The Classical Association of the Middle West and South was founded in 1905 as the first regional classical organization in the USA. It immediately began publication of The Classical Journal, which became only the second classical journal (excluding annuals) in the country. Twenty-two states belonged at the beginning; there are now thirty-two states and three Canadian provinces. The Association is much the largest of all regional groups; membership is open to anyone with classical interests, regardless of place of residence. The Classical Association of the Middle West and South. The First Eighty Years by Herbert Benario (Greenville, S.C.: CAMWS, 1989) is available here in pdf format. An update covering the ninth decade appeared in CJ 91 (1995-96) 309-17 and is available here electronically. A history of the years 1990-2004, entitled "The Last Score of Years," by Herbert W. Benario, appears in the program for the Centennial meeting (2004). A list of CAMWS Presidents is available here. A list of CAMWS Secretary-Treasurers is available here. A list of CAMWS Orators is available here. A necrology of CAMWS members is available here.